Shopping for a mattress can be a nightmare if you have to pull yourself through all those shops and an endless line of salespersons. The task can seem even more daunting if you don’t know exactly what firmness or softness suits your back. You can end up with years of uncomfortable sleep and a large, gaping hole in your pocket if you don’t make the right decision. 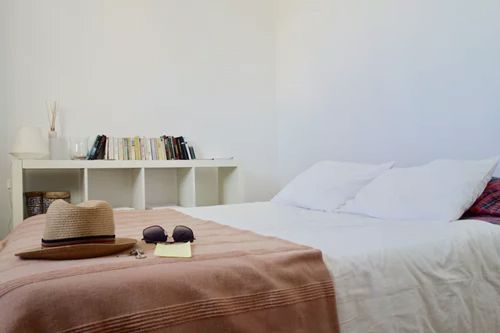 The more common single-sided mattresses are a relatively recent development in the bedding market as they took the industry by storm in the 2000s but reversible mattresses still tend to last longer than those non-flippable beds. This is because periodically flipping the mattress from one side to the other can reduce the wear and tear on it and increase the lifespan of your mattress. The sagging, which is a common problem with one-sided mattresses, can be minimized with these variants. More recently, there have been a number of two-sided or flippable mattresses that are engineered to include different levels of firmness on each side so that you can customize your sleep experience by setting your preferred firmness on top. You can order these mattresses online and they will be delivered right to your doorstep so that you never have to worry about running around a mattress store again. If you are looking for a two-sided mattress but getting confused by all the options that are in the market, here is a list that could be of great use to you. Go through all the features, advantages and disadvantages of each mattress to pick the one that is best for you! 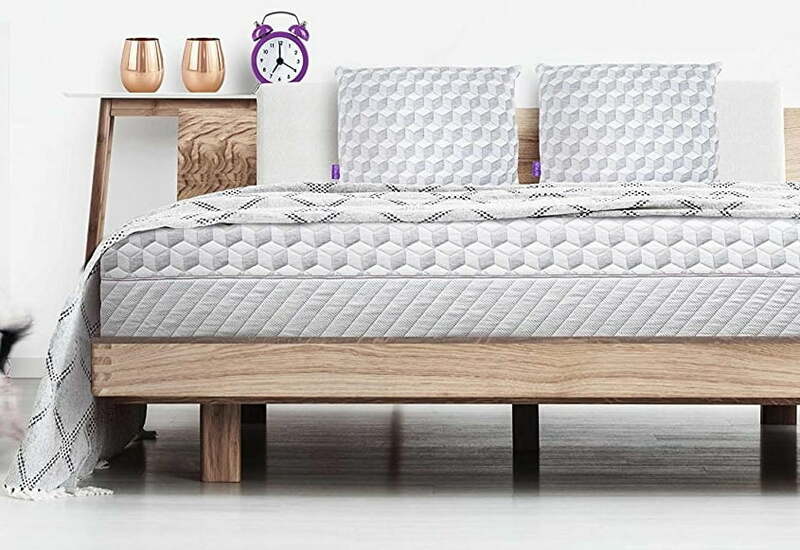 The unique selling point of the Layla mattress, which makes it very popular, is its two-side feature. This means that the people who like to sleep on their stomach or those who like firm beds can opt for the firm side of the mattress. There is another option if you don’t want your bed to be too firm – just flip it! When the mattress is flipped on the medium-soft side, it has great pressure-relieving capabilities. The mattress comes with a comfort layer that provides good pressure relief and a 3-inch memory foam layer that is infused with copper, a powerful conductor of heat. This keeps the person sleeping on the mattress cool and away from any health issues because of its antimicrobial properties. In addition to copper’s cooling features, the mattress cover is designed with a ThermoGel technology for an even more effective cooling effect. The mattress also boasts of great low motion transfer, which means even light sleepers can get some undisturbed sleep. Option of changing sides to get a different level of firmness, which means that you have the option of flipping it over if you want a firmer or a softer feel. Great for light sleepers or couples that have different sleep schedules because of its low motion transfer. Beneficial for warm sleepers because of the copper infused in the foam and the mattress cover that comes with ThermoGel. Good warranty that lasts as long as you own the mattress so that you don’t have to worry about wasting your money. There is not much bounce in this variant for those of you who enjoy that in a mattress. If you are on the heavier side or have a big build, the softer side of the mattress could be too soft and lead to you sinking in a little bit. If you feel that the Layla Sleep Mattress is the two-sided memory foam mattress that suits your needs, you can buy it here. Another great option when it comes to reversible memory foam mattresses is the Sweetnight Gel Memory Foam Mattress. As is evident from the name, this is a memory foam mattress that comes with gel infusion technology where gel is added to memory foam to boost air circulation within the mattress. This accounts for a cooler night, making the mattress ideal for warm sleepers. 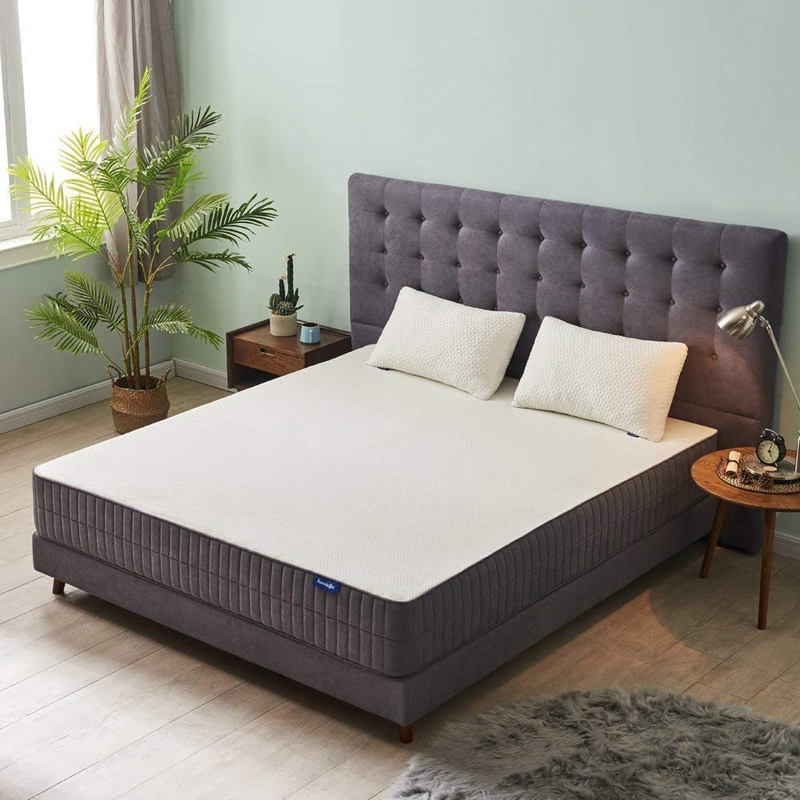 The Sweetnight variant is a two-sided mattress that offers you two densities on both sides of the mattress that is available in six sizes – king, queen, full, twin, twin XL, and California king. It is available in an 8-inch version, a 10-inch model and a 12-inch version. If you are looking for a mattress that will help relieve back and muscle pain but are feeling torn between a medium firm and a softer mattress, this could be a good option. The foam used in the mattress is CertiPUR-US certified, which means that it is made without harmful substances like formaldehyde, mercury or any other heavy metals. Mattress offers a different density level on both sides for greater versatility. Very comfortable and provides good pressure relief. Medium-firm side hugs your body just right. Does not have that chemically smell that is associated with many mattresses. Inflation process is quick and easy. Good motion isolation so that you can minimize disturbance during sleep. Neither side is very firm if you like the harder feel when it comes to mattresses. It’s quite large and unwieldy so you might need some assistance if you are trying to move and unpack it. If the Sweetnight Gel Memory Foam ticks all the right boxes for you, you can buy it here. 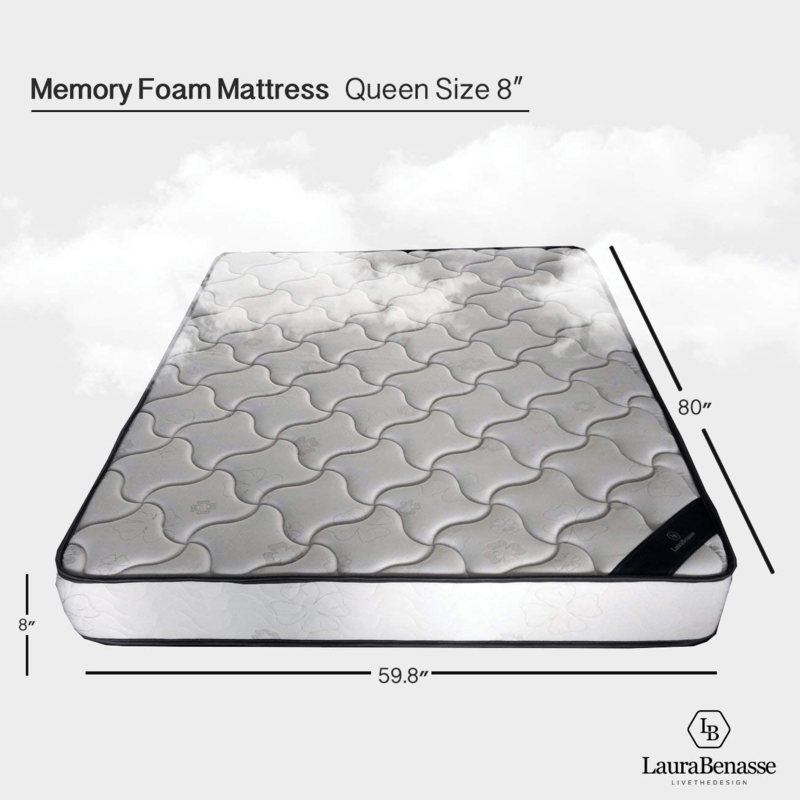 The Laura Benasse mattress is another great two-sided memory foam mattress available in the market. A memory foam mattress is essentially different from the usual foam mattress as it is denser that the latter. This makes memory foam mattresses more supportive and heavier than regular mattresses. They have an open-cell structure that reacts to your body heat and weight and molds itself to take the shape of your body. This helps in ensuring that your pressure points are relieved and you don’t get any pressure sores. Memory foam mattresses are usually more expensive than traditional mattresses but the 8-inch Laura Benasse mattress is on the cheaper end of the spectrum and proves to be a great deal. It is reversible and can be used on both sides. This is a great feature as it reduces the sagging that can occur in most mattresses over time. More affordable than most memory foam mattresses. Can be used on both sides so it will reduce the amount of wear and tear that the mattress could endure. Fireproof so you have one less thing to worry about. It takes some time to expand to the size that it is supposed to be. Not much bounce if you like that. After having acquainted yourself with its features, if you want to buy this mattress, click here. This is not a memory foam mattress but a coiled one. This means that the basic constitution of this mattress is very different from all the other mattresses that we have discussed before. It is also the cheapest option out of all these, falling in the under $100 category for the queen size variant. The basic structure of the Life Home mattress is made up of independently encased 15-gauge pocket coils that give the mattress great stability and strength. The coils are covered with a layer of good quality foam and polyester that give the mattress a decent level of comfort that is essential for a good night’s sleep. The mattress is reversible and can be used on both sides. It is a bed in a box mattress, which means that when it is delivered to your house, the mattress will be compressed and rolled up but can be opened without any difficulty. Very affordable and won’t burn a hole in your pocket. Opens up quickly and with great ease. Decently comfortable and won’t leave you with a bad back. Does not have the same comfort as a memory foam mattress. The levels of firmness will not be different on both sides as was the case with the other mattresses discussed. There is a bit of confusion about the sizes. If you want to buy this mattress, you can click here. Very different from the other two-sided mattresses, the Mozaic mattress is a futon mattress. With a cotton and foam based structure, this futon mattress has 8 inches of memory foam along with a tufted design on both sides that make it both comfortable to lie on and great to look at. The best part about this mattress is that it is reversible so that you can use either side of it as a bed mattress. 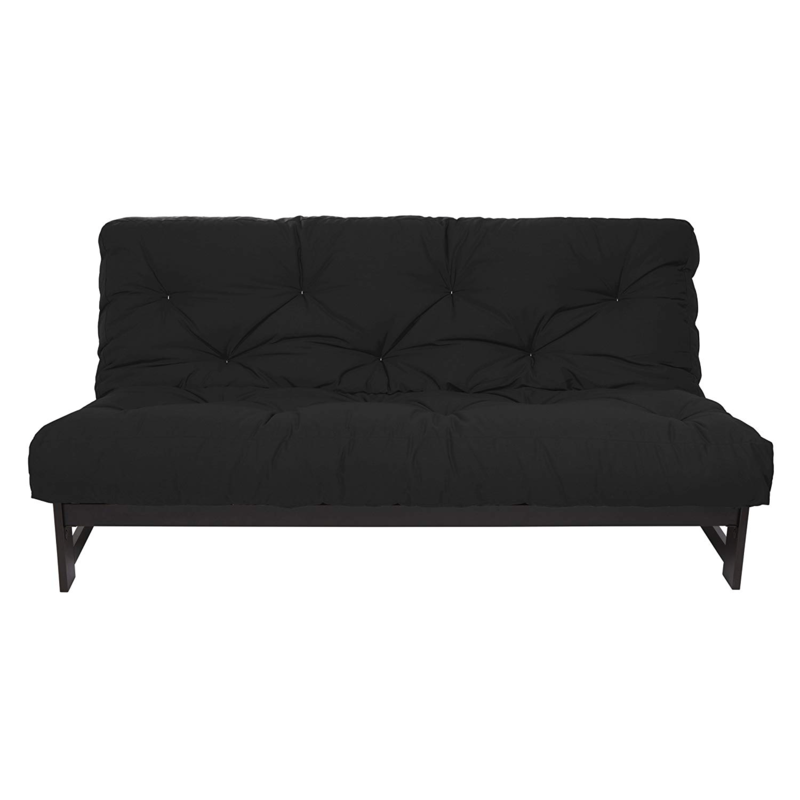 While it is being used as a futon, it is versatile enough that you can just put different types of throws on it to change its look completely. As opposed to other reversible mattresses that can’t really be rolled, this futon mattress is very easy to store as it rolls out quickly. Made in the United States, the Mozaic futon mattress is very easy to maintain and can be spot cleaned with some cold water and a mild detergent. The futon mattress is made of flame-retardant material that doesn’t react with inflammable substances easily and is non-toxic, which makes it safe for you to use it at home around small children and pets who may be more susceptible to harm. Tremendous comfort thanks to the memory foam used. Easy to maintain as it can be cleaned with ease. Highly versatile and can be used as both bed mattress and futon. Can be used for a long period and also easy to store when required. Frame is not included with the mattress. As it is vacuum packed, you will need to give it quite a bit of time to expand to its complete size. Strong off-gassing smell when you unpack it. Warranty period is very short. If you feel that the Mozaic Futon Mattress suits your needs, you can buy it here. Each of the mattresses discussed above have their own set of advantages and disadvantages, but it is important that you choose one that meets your needs best. For this, you can think of various factors like the size of mattress, its price, the technology used in it, what type of feel it has and whether it will be comfortable for you to use as a side sleeper or a back sleeper and so on. If your budget allows, the best option out of all of these is the Layla variant with its copper infused cooling system. This is particularly helpful if you are a warm sleeper and don’t want to wake up sweating in the middle of the night. It comes with a lifetime warranty, which makes it different from all the other mattresses discussed here. The Sweetnight Gel Memory Foam Mattress is also a good option if your budget can’t stretch to the Layla mattress. Finally, if you don’t really need a proper mattress and can manage with a futon mattress, the Mozaic mattress is not too thick, comfortable and versatile enough to be used in many ways.